Born to a prosperous Danish family and educated at Copenhagen, Søren Kierkegaard deliberately fostered his public reputation as a frivolous, witty conversationalist while suffering privately from severe melancholy and depression. In a series of (mostly pseudonymous) books, Kierkegaard rebelled against the prevailing Hegelianism of his time and developed many themes that would later be associated with the philosophy of existentialism. Much of his work, including Frygt og Bæven: Dialectisk Lyrik ( Fear and Trembling ) (1843), Begrebet Angest ( The Concept of Dread ) (1844), ( Purity of Heart is to Will One Thing ) (1847), and Sygdomen Til Døden ( The Sickness unto Death ) (1849), expressed a profound interest in religious issues. 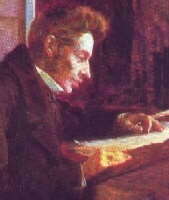 Kierkegaard also produced several more directly philosophical writings. Om Begrebet Ironi ( The Concept of Irony ) (1841) was his dissertation at the University of Copenhagen. Enten-Eller ( Either-Or ) (1843) provides an extended contrast between aesthetic and ethical ways of life, with emphasis on the ways in which radical human freedom inevitably leads to despair. The massive Afsluttende Uvidenskabelig Efterskrift ( Concluding Unscientific Postscript ) (1846) describes a third way of life, the possibility of living by faith in the modern world by emphasizing the importance of the individual and developing a conception of subjective truth. Kierkegaard's influence on twentieth-century thought has been rich and varied. Most obviously, existentialist thinkers like Jaspers and Heidegger drew extensively on his analysis of despair and freedom. Although he directly addressed few of the social concerns that most interested his contemporary, Karl Marx, Kierkegaard has received ample attention from more recent Marxists, including Marcuse and Lukacs. Philosophers from Adorno to Wittgenstein have expressed great respect for the Danish master's thought. William McDonald's article in * The Stanford Encyclopedia of Philosophy. The Howard V. Hong and Edna H. Hong Kierkegaard Library. Luc Desautels's essay on Kierkegaard (in French) at Encéphi. Antoinette Stafford on Kierkegaard's notion of subjective faith. Björn Christensson's brief guide to on-line resources. Robert Sarkissian's summary of Kierkegaard's philosophy. .
Last modified 23 November 2011.